Trusting Our Children, Trusting Ourselves". Maddie was hard pressed to be out of my sight today, although now Eric's home, and she's downstairs with Trev and her Daddy, Trev is showing Eric what his dinosaurs-in-the-sand are up to today. The new sand table has been a great success! Trev loves it. Maddie wanted up on the kitchen counter while I was in there, so I put her up, as I was close by, and then had to take her down as she was sitting facing the cabinets, and I was worried she was going to topple over backwards, forgetting where she was. She would have none of that bossiness from me, so I drug over a chair from the table so she could climb up and down at will, and that pleased her. 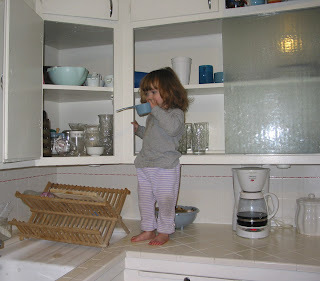 She then opened up my cupboards and preceeded to rearrange my apparently dissatisfactory organization of bowls, measuring cups , cups and glasses. There is an experiment that we set out some water for a couple of days ago. 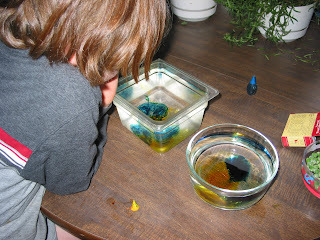 You set out some water, as it will take several hours to be still and settle, then you experiment with food coloring to see what happens. You take turns with "fast" water, too, and different things. We tried it, but found that our water that had set behaved no differently than the water that was just poured. But it was certainly interesting, the reactions were very cool to see. I wanted to take a neighborhood walk today armed with the binoculars, but we didn't get out at all. Maddie is wanting to go outside also, so hopefully we can spend a fair amount of time tomorrow outdoors.